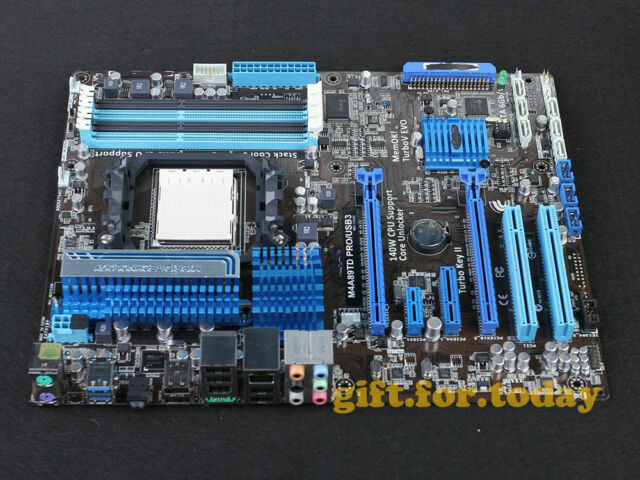 The ASUSTeK COMPUTER M4A89TD PRO/USB3 is a Motherboard designed for use with PC systems, which support ATX form factor. Built around the AMD 890FX chipset, it efficiently handles data flows between the connected devices. Equipped with Socket AM3 connector, the model is compatible with AMD CPUs such as Phenom II X3, Athlon II X2, Phenom II X2, Athlon II X4, Athlon II X3, Phenom II X4, Phenom II X6, Sempron. Short and sweet. I have my 965 OC @ 4.7Ghz. Stable. Some times I play with it up to 5.0 Ghz without no crash obviously is liquid cooled on a cool master case. Used to do Xfire with two 6850 now I run only one R9 290. I can play BF4 in eyefinity in high when on-line and ultra when single player. Superstable mobo and I just ordered a FX6300 to build another computer with this mobo. Got an extra mobo either to build a third one or back up. No need to spend up to 4-5 times more when you can have it all here unless you want 200+ watts for a processor where you can cook on it.